According to Section 250 of the City Charter, the Mayor has 10 days to act on the ordinance, meaning he can act on it on the same day, or 10 days later. Assuming the Mayor approves it, the City Clerk’s Office will then post the adopted Ordinance for a period of 10 days and a 30-day effective date will begin after that. Simply put, the earliest an Ordinance can realistically go into effect is 40 to 50 days after it is adopted by the City Council. When we have an effective date, we will notify the individuals on this interest list by email. Feel free to forward this information to anyone you feel might be interested. If you received this email via forwarded message from someone else, and you would like to receive updates directly from the Planning Department, please email katherine.peterson@lacity.org and ask to be added to the interest list. Please type “Add Me to Backyard Beekeeping Notification List” in the subject line and provide your group/organization/company affiliations and contact information (please include at least your zip code). 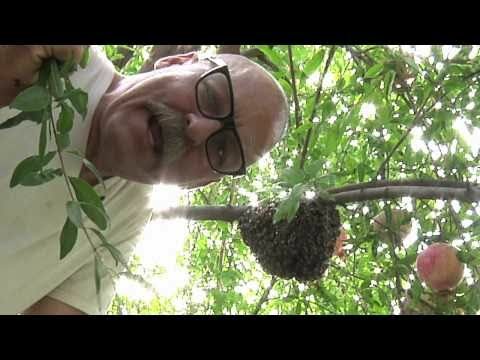 Rob McFarland holds a beehive at a Culver City residence in 2012. He and his wife have led an effort to make beekeeping legal in LA. We need bees. We want more bees. So legalize beekeeping, L.A.
Los Angeles is honeybee heaven. The warm Southern California climate and long growing seasons provide year-round food for bees. The city’s trees, flowers and flora are largely free of pesticides. It’s the perfect place for backyard beekeeping — except that beekeeping is not legal here. There’s a good reason to allow it. Commercially raised bees used to pollinate crops are disappearing in big numbers because of what’s known as colony collapse disorder, but nobody knows what’s causing the problem. Urban honeybees may end up replenishing the diminishing supply, or providing disease-resistant genes that can be introduced in the commercial bee lines. Los Angeles should follow the lead of other major cities and draft rules that allow residents to keep bees, while providing some common-sense protections for neighbors. There’s already an established backyard beekeeping community in Los Angeles despite the fact that it is not legal. The growing urban agriculture movement has spurred more interest in homegrown hives (in part because the bees are needed to pollinate the new urban crops) and more confusion over what is and isn’t allowed. New York City allowed illicit apiarists to come out of the shadows in 2010, and since then hobbyists have established hives on building roofs and in backyards. The city set basic rules: Colonies must be in well-maintained, movable frame hives with a constant water source, in a location that doesn’t pose a nuisance. Beekeepers file a one-page hive registration form with the city health department each year. Santa Monica permitted beekeeping in 2011 with similar requirements. Residents are allowed two hives per backyard, and the hives must be at least five feet from the property lines. Apiarists who don’t follow the rules or who let their hives become a nuisance to neighbors face fines or misdemeanor charges. Both cities said they’ve had no major problems; beekeepers have largely followed the rules or moved their hives in response to complaints. And city officials said there’s been a benefit: a larger network of amateur beekeepers to call upon to remove swarms rather than exterminate them. We need bees. We want more bees. It’s time to legalize beekeeping. Did you know that bees pollinate one out of every bite of food we eat? Rob and Chelsea McFarland founded HoneyLove.org to inspire and educate people about becoming urban beekeepers.